US President Donald Trump’s national security adviser has said that Turkey could end its lira-battering crisis with Washington “instantly” by freeing a detained American pastor, adding that a Qatari cash infusion would not help Ankara’s economy. The Turkish currency has been in freefall since Washington ordered tariffs in retaliation for the detention of Pastor Andrew Brunson on charges of complicity in a failed 2016 coup. Brunson denies wrongdoing, and Ankara has in the past suggested his fate could be linked to that of a US-based Turkish religious leader whom Turkish President Recep Tayyip Erdogan accuses of orchestrating the attempted putsch. Brunson, who has lived in Turkey for two decades, has been detained for 21 months on terrorism charges. He is now under house arrest. “Look, the Turkish government made a big mistake in not releasing Pastor Brunson,” John Bolton told the Reuters news agency in an interview during a visit to Israel. Qatar’s Emir this month approved a package of economic projects, including a $15bn pledge of support for Turkey, giving a boost to the lira that has lost some 37 percent of its value this year. Bolton was sceptical about the intervention by the Gulf state, which has been feuding with US allies in the Middle East such as Saudi Arabia, United Arab Emirates and Egypt. The Turkish lira has lost 37 percent of its value this year in a currency crisis triggered by concern over Erdogan’s influence over monetary policy and exacerbated by the dispute with Washington. 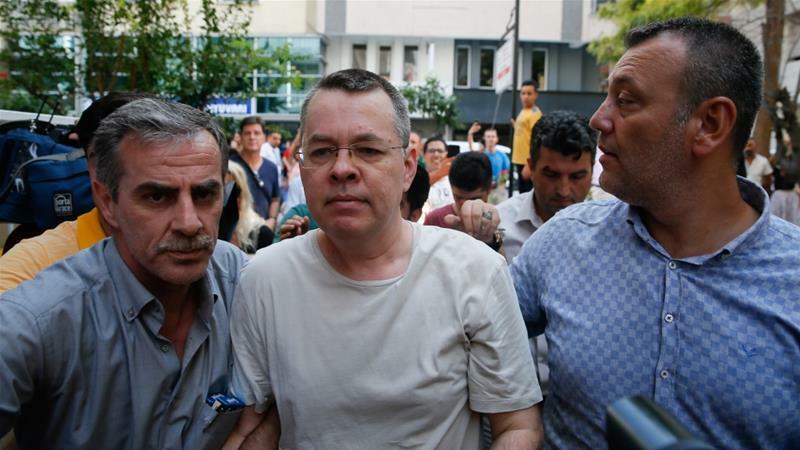 Last week a court in Turkey’s Izmir province rejected an appeal to release Brunson, saying evidence was still being collected and the pastor posed a flight risk, according to the Turkish media.